An iconic marriage made in heaven: strawberries and champagne! This stunning and delicate strawberry champagne cake has definitely captured my heart and I’m sure it will capture yours, too! 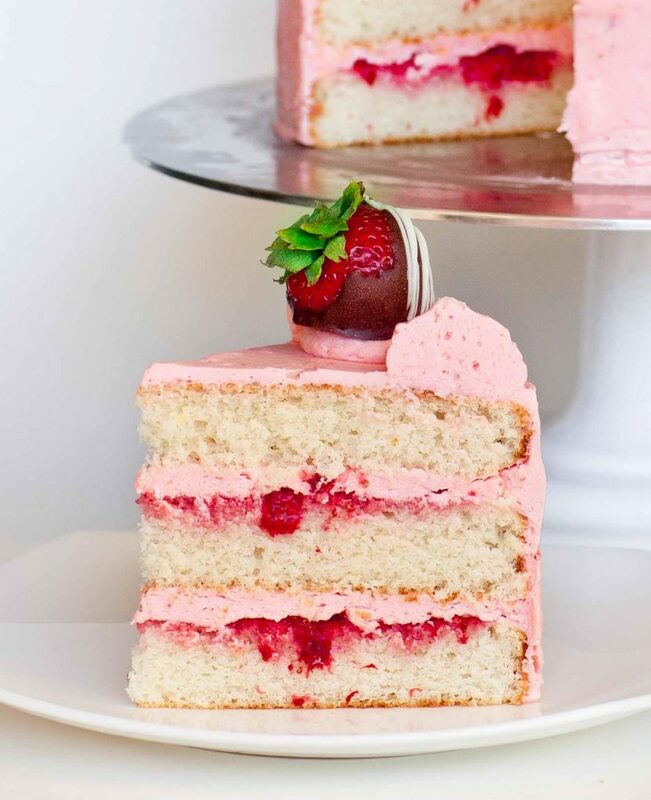 This incredible cake is made with champagne-flavored cake layers and frosted with a sweet and tangy strawberry frosting! Garnish this stunner with chocolate covered strawberries and you have a show-stopper fit for any special occasion. To get the most champagne flavor into my cake layers, I used a combination of sparkling wine and champagne extract. The extract is absolutely delicious and it really ups the flavor of the cake layers. Get the sparkling wine extract on Amazon; link in my shop! If you prefer to make a non-alcoholic version of this cake, just use some non-sweetened grape juice, or reduce the amount of sugar in the recipe. 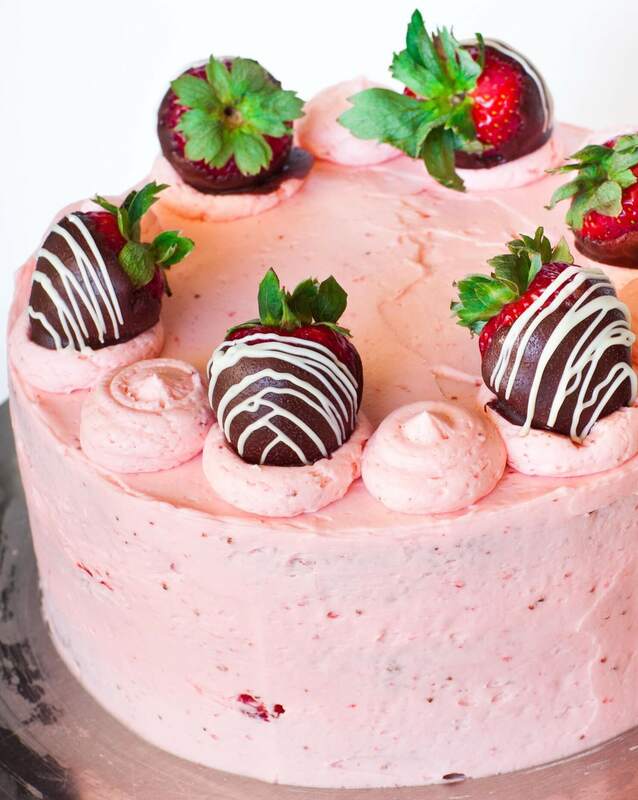 The strawberry buttercream recipe is killer good, too! You’ll want to eat this frosting by the spoonful! I added a little bit of citric acid to make the buttercream a bit sour and tangy, which helps balance out the sweetness. A little tip for making berry buttercreams: make sure to add the fruit puree very last, after you get your frosting to the consistency you want it to be. Mix the fruit in for about 30 seconds, no longer; otherwise, the frosting can separate. How good does this slice of cake look?? Save it to Pinterest for later! Preheat oven to 350F. Line 3, 8-inch cake pans with parchment paper; recipe will also work well using 2, 9-inch cake pans. Using a hand mixer or a stand mixer, cream together the sugar and butter until creamy. Add the egg whites and vanilla and mix until mixture is light and airy. Mix in the sparkling wine and milk. In a separate bowl, combine the dry ingredients: flour, salt and baking powder. Sift the dry ingredients into the cake batter and mix the flour just until well combined. Divide the cake batter between the prepared pans. I recommend using a kitchen scale to accurately divide the batter. Bake the cake layers in preheated oven for 35-40 minutes, or until the tops are completely set. Remove from oven and place cake rounds onto a cool rack to cool completely. Meanwhile, prepare the frosting and filling. For the filling, simply mash together 1 cup of fresh strawberries (or thawed, previously frozen berries); set aside. For the buttercream, whip the softened butter on high speed for 5 to 7 minutes until light and fluffy. Add the 1/3 cup strawberry puree (I used a food processor to make the puree) and the strawberry extract. I used a strawberry emulsion, which already had food coloring. Otherwise, also add a few drops of red food coloring. Add the citric acid, or if unavailable, substitute with 2 tablespoons of lemon juice. Whisk buttercream until ingredients are well combined. Add the confectioner's sugar and continue beating the buttercream for another 5 to 7 minutes until light and fluffy. To assemble the cake: level the cake layers using a long serrated knife. Spread half of the mashed strawberries onto the first layer, followed by buttercream and second cake layer. Use the remaining strawberries on the second layer. Frost the top and sides of cake and use a flat spatula to even off the top and sides. Place into refrigerator to set before garnishing, about 20 minutes. Optional: transfer any remaining buttercream into a pastry bag and add dollops of frosting on top. Can also top with chocolate covered strawberries; strawberries will last for 24 hours. If making this cake ahead of time, wait to add the strawberries until serving. Keep cake refrigerated and take out to room temperature 30 minutes before serving. What kind of wine did you use? Just any sparkling wine? Btw this looks delicious and I can’t wait to make it this weekend! I think she said white grape juice but the alcohol will probably wear off in the oven if you do decide to use champagne. I like the cake to be super moist. Do you think saturating the layers with the wine (prior to adding the cream) will be a good idea? If not, what could I saturate the layers with? I can’t wait to make it! It looks amazing!! Three questions did you use salted or unsalted butter? Did you use regular vitamin d milk? Lastly didn’t I hear you correctly when you said to peel the strawberries? I really want to try this recipe but don’t want to mess it up in any way it looks delicious. I always use unsalted butter in all of my recipes, unless otherwise noted. I also use whole milk in most of my recipes; love the rich flavor. And I just cut off the green tops for the strawberries! 🙂 Enjoy! What can i use instead of wine, something non-alcoholic? What recipe adjustments, if any, needed to be made for high altitude.